In 1931, Eleanor Barzin gifted her mother, Marjorie Merriweather Post, one of the 50 famous Fabergé eggs made for the Russian Imperial family between 1885 and 1917. Now, that’s a gift. Catch Post's expansive Fabergé collection this summer at Hillwood Estate, Museum and Gardens. See photos. WASHINGTON — What did you get your mother for her last birthday? In 1931, Eleanor Barzin gifted her mother, Marjorie Merriweather Post, one of the 50 famous Fabergé eggs made for the Russian Imperial family between 1885 and 1917. The “Catherine the Great” egg is one of two eggs and nearly 90 Fabergé pieces Post collected throughout her lifetime. And through Jan. 13, 2019, those items are on display in “Fabergé Rediscovered” at D.C.’s Hillwood Estate, Museum and Gardens. 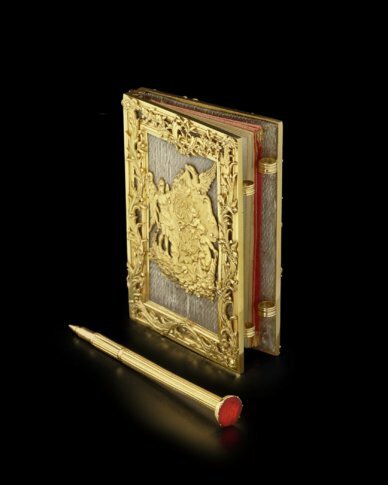 Notebook (Carnet) with Pencil, St. Petersburg, 1741-1761. Hillwood Estate, Museum & Gardens, acc. no. 11.30.1-2. Photographed by Alex Braun. “It’s all about the rediscoveries and new stories about our objects here at Hillwood,” said exhibit curator Wilfried Zeisler. Zeisler explained the 2014 discovery of one of Fabergé’s lost eggs (10 disappeared during the Russian Revolution and several are still missing) reshuffled the timeline for some of the jeweler’s other objects. The newly found egg, Tsar Alexander III’s 1887 Easter gift to his wife, Tsarina Maria Feodorovna, resurfaced at a flea market in the Midwest, of all places. Newer technologies are also helping to bring the historic objects to life. Zeisler pointed to a 3D-printed recreation of one of the “surprises” hidden inside a Fabergé egg (a folded silver frame for miniature portraits). Visitors can listen to music play from a Fabergé music box, view an egg on loan from Prince Albert II of Monaco, and check out a rare wooden Fabergé case (Zeisler estimates the jeweler only made about 10 pieces of furniture in his career), which Post purchased in the 1930s to display her growing Fabergé collection. “Fabergé Rediscovered” is now open during Hillwood’s hours of operation, Tuesday through Sunday, 10 a.m. to 5 p.m.